There are two kinds of people who attend auto shows – those who plan to buy a new car soon and want to see them all in one place to make comparisons and narrow their choices or those who simply want to be thrilled by the latest models and especially the ground-breaking concepts that herald the cars of the future. The New York International Automobile Show is no stranger to this concept, so it is little wonder that some of the most innovative and exhilarating concept cars and trucks will be present for this year's event. As automakers place a renewed emphasis on aerodynamics, efficiency, technology, safety and styling, NYIAS will look into the crystal ball to reveal the future of what some of us may soon be driving. The show opens in two weeks running March 29 to April 7 in the Jacob K. Javits Convention Center in Manhattan. “These amazing automobile creations are what generate the buzz and excitement around the Show,” said Show Director Alan Liebensohn. 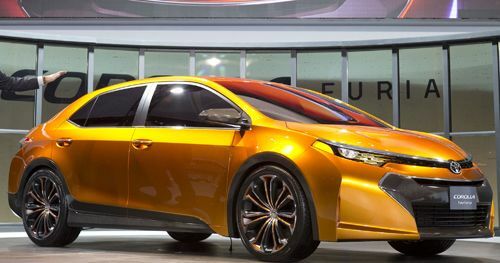 “Above all, concepts vehicles are the things that excite, amaze and capture the imagination as they have for generations of car lovers,"
The much anticipated Toyota Furia Concept continues Akio Toyoda’s challenge to build more exciting cars and this compact sedan reveals the styling cues expected in the next-generation Corolla. Aimed at a youthful demographic, the Furia embodies the theme of Iconic Dynamism, a crisp, clean approach to surface elements that instills a confident and unique appearance. The Acura NSX Concept channels the next-generation of the supercar’s coming style evolution. Delivering the next level of supercar dynamics via stunning performance tempered only by environmental sensitivity, the NSX features a mid-mounted, direct-injected V-6 engine tied into Acura's Sport Hybrid Super Handling All-Wheel Drive system. That’s not only a mouthful, but something we’re all aching to experience. BMW’s i3 coupe sports a rear-mounted electric motor boasting 170 horsepower and 184 lb-ft of torque via a single-speed transmission. This urban sustainability vehicle has a spacious interior with what the brand referes to as a lounge-style ambience of two individual rear seats. The all-electric, no emission i3 lithium-has an impressive range of 100 miles in mixed driving conditions. Hyundai’s HCD-14 Genesis carries a powerful 5.0-liter, V8 engine in a sporty 4-door coupe that combimes power with low emissions and super efficiency. The interior is the product of ergonomic engineering to produced what’s characterized as an intuitive driver interface with state-of-the-art driver eye-tracking and 3-D hand-gesture recognition system. This is the next step in automotive manipulation via eye-tracking, thumb controls or gestures used to select navigation, infotainment, audio, HVAC and even smartphone connectivity functions. The Honda Urban SUV Concept seeks to defin the future of small SUVs in a responsive, fuel-efficient package with new styling and next-generation connectivity, hinting at Honda’s new styling direction. Though nine inches shorter than the CR-V, the Urban SUV Concept is just the right size for urban streets and mountain roads. BMW’s Concept 4 Series Coupe delivers the soul of performance in the essence of a new, sporty yet elegant generation of transportation defined by contemporary luxury. A finely appointed interior provides the prefect environment to highlight perfectly balanced coupe proportions. Inside, skilled handcraftsmanship and carefully selected materials combine to create a supreme ambience like no other. Lincoln brings out the MKC Concept, the new luxurious small utility concept seeking the perfect balance between inviting comfort and the engaging dynamics of performance, handling and braking. The brand is seeking to define and establish a new level of luxury called cultural progression. This concept sets the benchmark for future Lincolns that will combine performance with the option of stunning interior design to transcend typical luxury automotive standards. The ACURA MDX Prototype reveals the style and direction of the third generation 7-passenger MDX focusing on more dynamic performance, improved fuel economy and extreme comfort. Refered to as Aero Sculpture, the new style configures a compact, premium visage in a low, wide and sleek stance creating a crisp, clean and uncluttered design distinguished by the elegance of premium detailing. The VW BlueCross concept is a six-seater mid-size SUV concept concieved specifically for North America. Powered by a plug-in hybrid powertrain coupling a diesel engine with two electric motors, a dual-clutch automatic transmission, and an electric all-wheel-drive system, it offers estimated gasoline fuel economy of 35 mpg, but 89 mpgE in electric mode. The Nissan Resonance engenders a future direction for Nissan crossovers marked by edgy design that elevates the crossover with new aerodynamics, a spacious interior and an advanced HEV powertrain. The futures of cars is rapidly changing as alternative energy sources find their incarnations. The future holds more and more hybrids, electrics, advanced and evermore efficient internal combustion engines, not to mention multi-fuel vehicles, CNG power, fuel cell technology and more. The auto shows of the next 20 years will continue to offer more and more exciting choices in vehicles until the age of the autonomous car ends the individual experience and makes cars into public conveyances. Nevertheless, it is a marvelous time to be alive as the Industrial Age ends and the Technogical Age begins. See you in the next world and don’t be late.